Sometimes when a new season rolls around I tend to get a little nervous. I wonder if I will be able to come up with something new to share. I worry that I’m showing you the same old thing…like an old lady wearing the same dress all the time but switching out her hat. Hoping that people won’t notice the worn out dress and remark on what a lovely hat she is wearing. 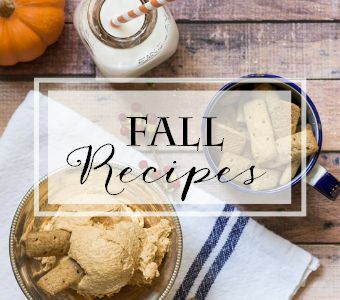 So this fall, I concentrated on easy and budget-friendly things that anyone can do. 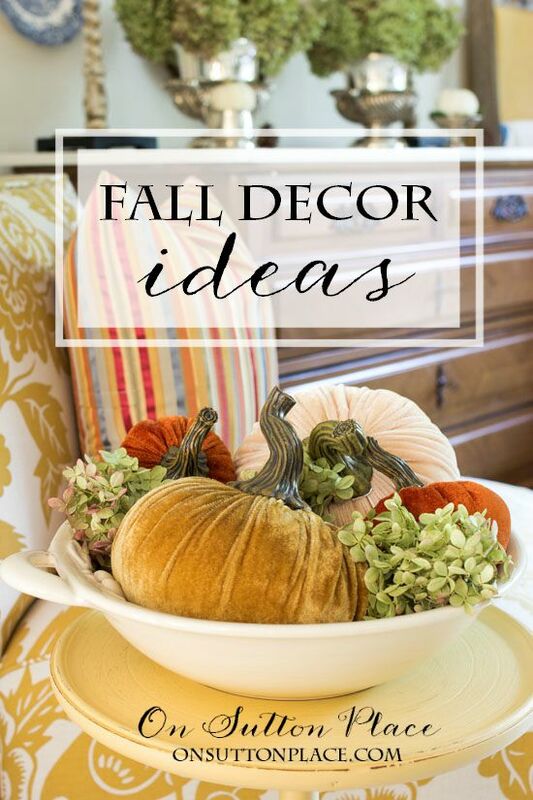 DIY fall decorating ideas that require no special skills. I didn’t try to come up with anything over-the-top…this is easy. I promise. The first thing I did was buy some fresh flowers. They are from the grocery and were $7 a bunch. I got 2 bunches so I thought that was a pretty good price. I stayed with the color combo of copper and blue that I began on the front porch. I know fresh flowers are a temporary thing but honestly, they made such a difference. They looked so pretty that it motivated me to do the rest of the room. I went through my pillow cover stash for something to put on the sofa. I found a set from a few years ago that I forgot I had so out they came. I realize that most of you don’t have a pillow cover stash. In that case, try hitting up TJMaxx or a craft store. I am amazed at the pillow cover selection available now at Hobby Lobby…and they are good quality for a good price. My one splurge was this pillow from Pier 1 pictured above. I absolutely could not resist the blue and copper medallion. (FYI: Pier 1 had a boat load of wonderful pillows in autumnal colors. Definitely worth a visit.) I paired it with a blue striped throw from TJMaxx. I added a little fall color to the shelves with dried hydrangea blooms, green moss and flowered plates. Last year I bought my first velvet pumpkins…the gold ones. You can see how I used them last year HERE. These have become my favorite fall decor item. This year I added the ivory ones that are a bit smaller…and the even smaller copper ones. I couldn’t find the exact thing online but HERE is a link to an eBay search with a great selection in all price ranges. If you buy even just one thing this fall to refresh your decor, I highly recommend a velvet pumpkin. It will make you smile. I picked up the striped fabric at Hobby Lobby because it had all the colors I wanted. I made two envelope pillow covers and I even followed my own rules for mixing fabric patterns! So there you have it. 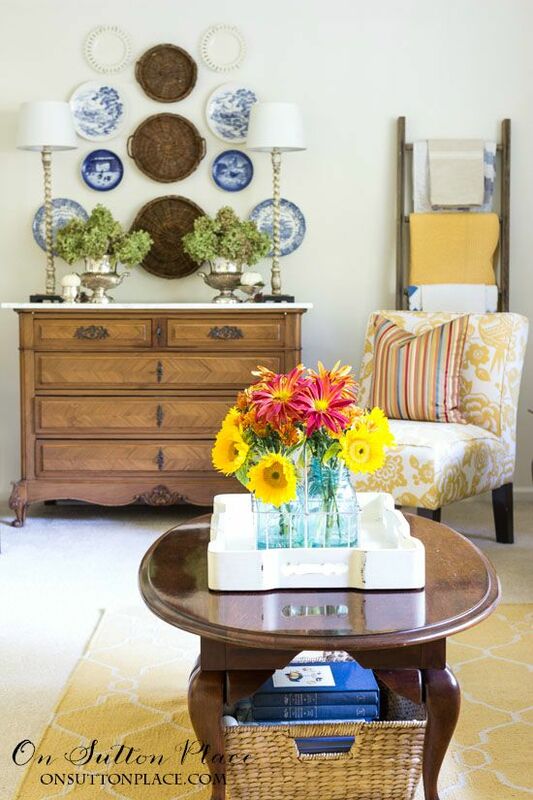 Pops of color sprinkled around the room, fresh flowers, new pillows and some velvet pumpkins. Really not all that much but it absolutely refreshed the space. Remember all the times I have said that if you walk into a room and smile that you’re on the right track? Well…those velvet pumpkins put a smile on my face every time. I must be doing something right. Just a reminder…the blue text means a clickable link to sources or helpful posts. Thank you for stopping by. Many of you have told me that you enjoy the Sunday posts and I’m very glad. They are my favorite ones to write so I will keep them coming. Have the loveliest day ever. 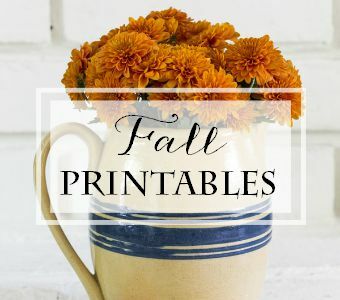 Just click the images below to visit my favorite Fall categories for more inspiration! Hello! I somehow landed at your sight this am–one thing leads to another lol. Enjoyed it. Oh I know –the velvet pumpkins! That’s what brought me here????????. I love them also and picked up three beauties this year. So so pretty! Never saw them before and I have to agree with you. They are my favs for sure. And they truly make me smile when I look at them. Happy Fall! I always love your style, Ann. I saw some velvet pumpkins at TJ Maxx. I love how you put them in a bowl with the hydrangea. I just may have to copy that! 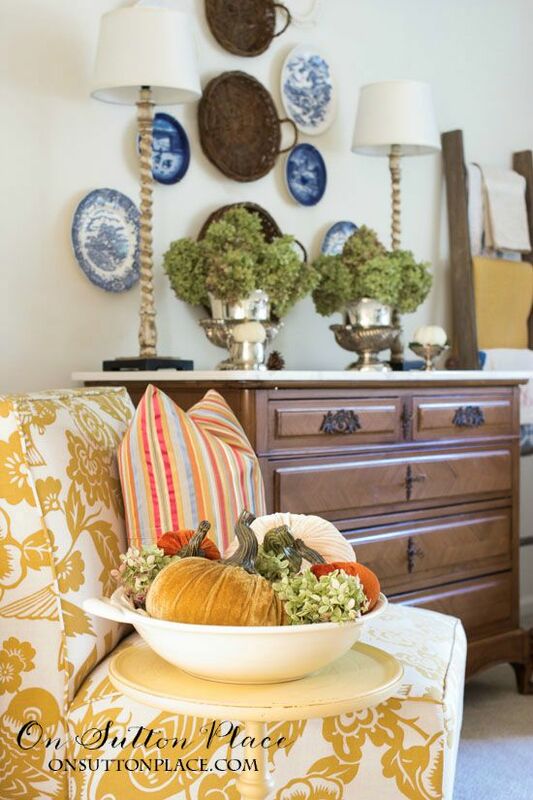 Love how you incorporated blue into your autumn decor, I am currently drooling over some vintage chenille pumpkins I spied on Pinterest. Ann your blog and your home is perfect. I love every inch of your blog, the little icons on the side of each post is beautiful… the entire blog template is the BEST I’ve ever seen not to mention your fabulous content. Ann, your home is always so lovely and welcoming. I always enjoy opening a new email from you to see what’s new and how you’ve decorated. Thanks for sharing with us. Also, I look forward to more products in your shop! Great Fall decorating. 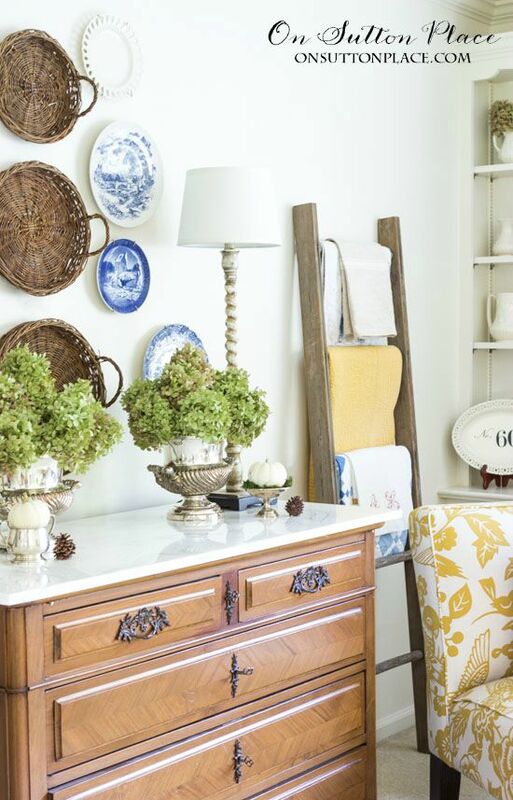 I never get tired of seeing your arrangement of plates and wicker trays on your wall. It inspires me to do a similar wall somewhere in my house. Thanks for the great ideas. Just a quick email from the UK to say what a pleasure it is to read your posts. You have such a lovely way with words . Our Autumn is now well on the way and we are currently enjoying glorious blue skies, lots of sunshine and the fabulous leaf colour….such a change from the lack lustre summer! Velvet Pumpkins are on my “must have” list. I love all the things that you did with your room. I especially love your front porch. We live in a high rise condo and there is no opportunity to do such a wonderful and inviting entry to our unit. We live in Ontario Canada and don’t have access to all the places you post on your site but I have found some very good alternates. Your site has become one of my favourites and I look forward to seeing something new each week. I am looking at the velvet pumpkins and would they be that hard to make – have to look into that project. Loved your remark about entering a room and it makes you smile – that is my philosophy too!! Hi Lucille! Thank you for writing. I do think the velvet pumpkins would be easy to make if you can find the right colors. Maybe a year or two ago I looked but didn’t have much luck. The velvet has to be out there though because there are tutorials on Pinterest and people are selling them on eBay. Good luck! I love the velvet pumpkins!! I want to try making my own and have a stem ready to adorn the top! Just need a bit of velvet now! Always look forward to each of your posts and esp. The DIY ones! Everything is lovely! Happy fall! I love the velvet pumpkins too, I now have two! Every year I figure I’ll get one and someday have a wooden bowl full! I’ll be going to Hobby Lobby this week so I’ll be sure to check out the pillow covers! Thanks for all your ideas,i love how you decorate your house,simple and wonderful. I may have already said it but you are very good. 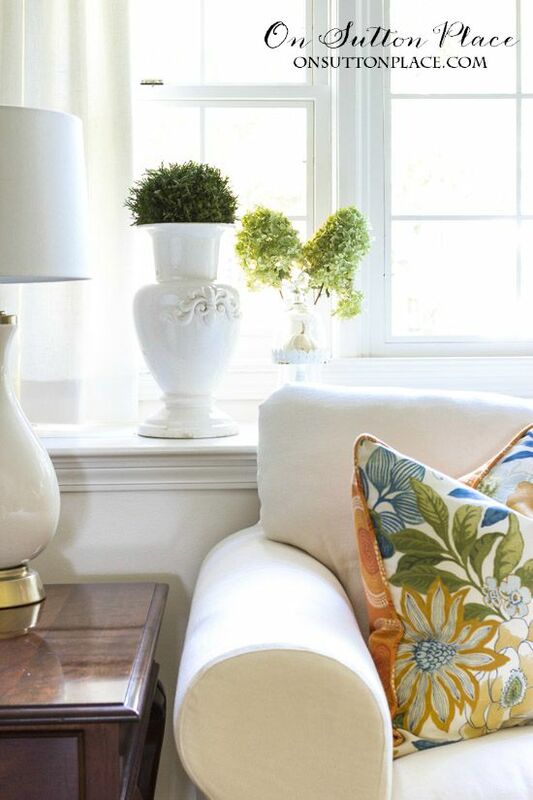 Everything looks fresh and pretty..I always love your pillows and your choices this year are perfect. I agree. I love the velvet pumpkins. 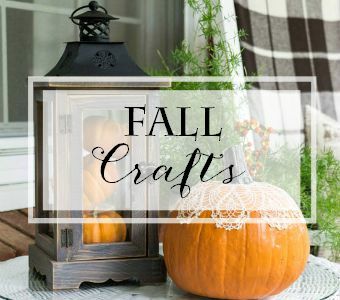 Thanks, Ann, for sharing your creative fall ideas. Never boring! Great colours and items for Fall and such a pretty room. I really like how the plates (the blues, creams and the flowered) tie in with the pretty pillows and gorgeous velvet pumpkins. Love all the pops of color you added for fall! Fresh flowers always make me happy!! Have a great week. It’s lovely in every way! Simple, warm, classic!! Lovely post, Ann. Simple, yet lovely, additions that ‘read’ fall. I think I need to head to Marshall’s where I spotted velvet pumpkins. 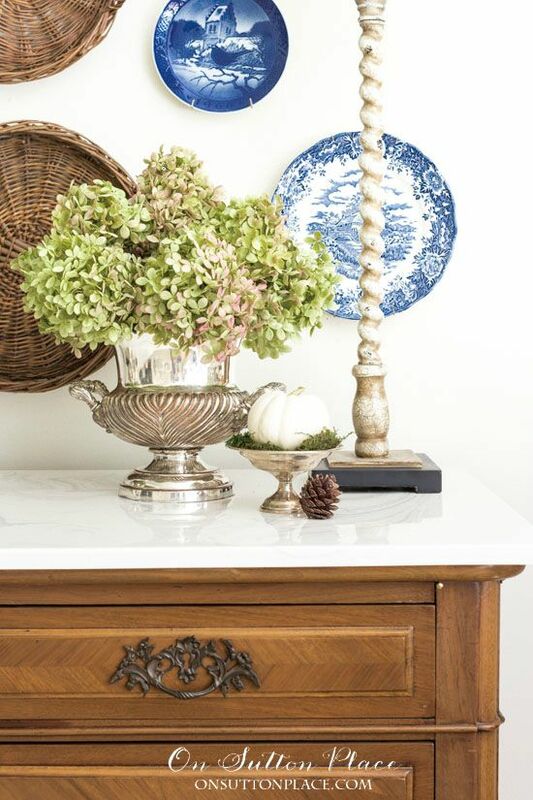 I am such a huge fan of limelight hydrangeas… Fun to see them peeking out in lots of places. Hi Ann, Just bought my first velvet pumpkin. Love it. Need to buy more. I am also a sewer and just looked at your French seam pillow cover tutorial. Never used a French seam in pillow cover but I will now. Great idea. Hi Cathy! French seams are a great alternative if you don’t have a serger. They make SUCH a difference. Good luck! Ann, your decor is so beautiful and inviting! Always look forward to your email post!! We will soon be making a choice on new sofa/love seat for our living area. 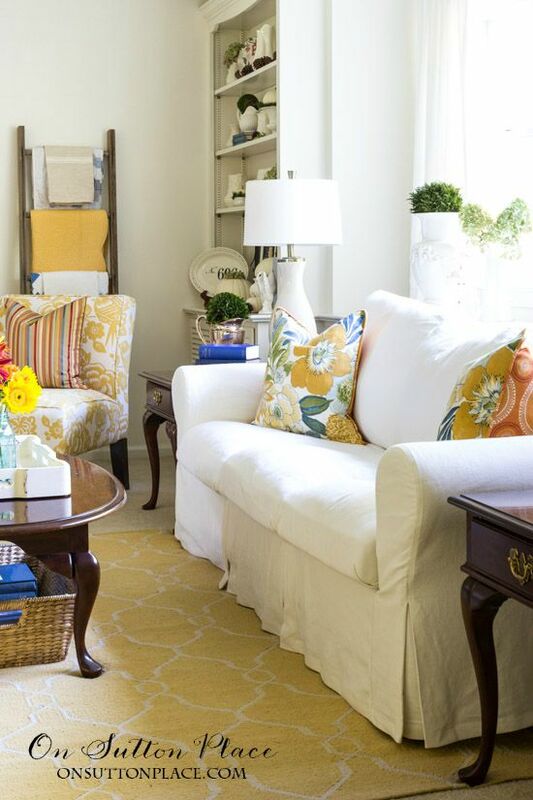 Are you happy with your choice of slipcovered furniture? I’ve never had slipcovers, but drawn to the look and the ability to switch it up easily with different pillows as you do, not to mention laundering if needed. My concern is this room will be used extensively and the worry of constantly smoothing and tucking to keep them neat is keeping me from taking the plunge. Do you have any advice? Your rooms are picture perfect…..do you use your sofa?? I love all of your fall décor. The pillows are wonderful and I LOVE the velvet pumpkins. Thanks Penny! I hope you are enjoying Fall in your new home. I will be by to visit soon. Your plate gallery on the wall is lovely! Could you share your source for the wicker round plates? They give the gallery such great texture and add warmth to the blue and white plates. Hi Shelley! The wicker trays were a Decor Steals deal of the day. They occasionally offer them so if you subscribe to their email list you can catch them the next time. Just go to http://www.decorsteals.com. Thank you! Your autumn space looks wonderful! Inspiring enough that I plan to go thru my fabrics today to see what I can come up with. I always look forward to your Sunday posts, makes my day and makes me smile :-)! 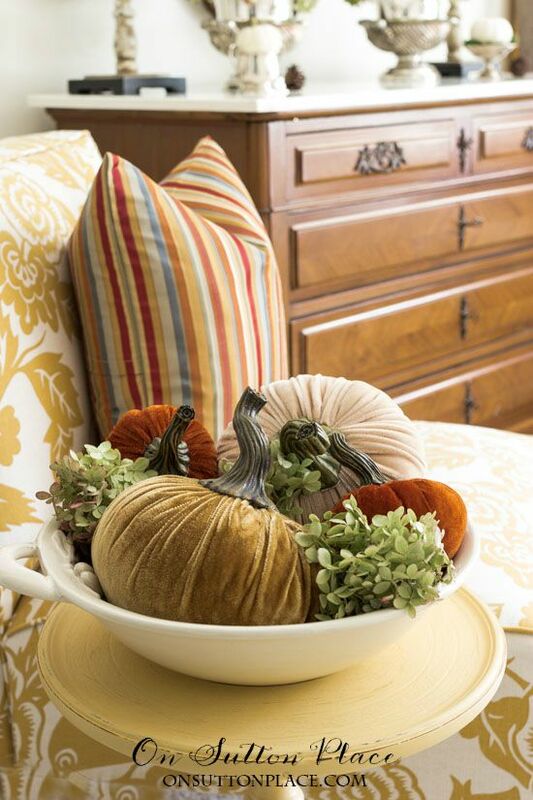 Love your fall accents! I, also, love the velvet pumpkins! I love them so much that I made a harvest-load of them for my home! So easy and so beautiful! The only thing I’m missing is the authentic stem….but I now know how to dry real pumpkin stems, so next time I’ll use those! I just love reading your blog! Thank you for all your creative idea! Hi Delanie! Would you mind sharing where you got your velvet? I had a hard time finding it in the right colors. Thank you! One of the things I like best about your blog is the somewhat simplicity of it. You are not forever buying new furniture, new decor or always talking about your shopping trips. You are real…..your blog is real and the pride you have in the many things you do is real. Thanks for keeping things simple and thoughtful for those of us that like to live our lives simply, thoughtfully and with meaning. Hello Mary…thank you from the bottom of my heart for this lovely comment. Like I said, sometimes I wonder if I have anything really meaningful to share. Your words of encouragement are kind and very appreciated. Happy Fall to you! As usual, I like your decor! I need to make pillow covers so I can change the feel of my living room with all the pillows that I have in that room. I can feel the need for a few of those velvet pumpkins, although I have a pumpkin made of horseshoes and it is painted orange so my decorations go toward being country!!! Everything looks lovely Ann. I love the whole room. 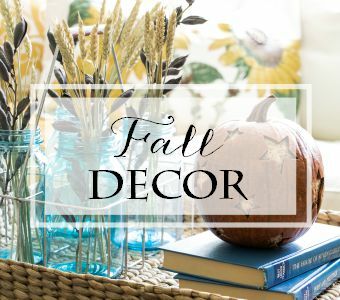 Your home is ready for fall and looks beautiful. Agree regarding velvet pumpkins. I have been collecting them for about three years and found the very best to be those created at Hot Skwash. They use real pumpkin stems with the very best velvet and size the pumpkin to best match the stems. Hi Carolina! I have not heard of Hot Skwash but rest assured I am checking them out right now. Thank you! I just returned from trip to Door County, WI. I bought 4 velvet pumpkins. They tickle me every time I look at them. I am new to your site and thoroughly enjoy your ideas. You are my kind of decorator. ???????? Beautiful, just the right touch of fall. Looks great, Ann. 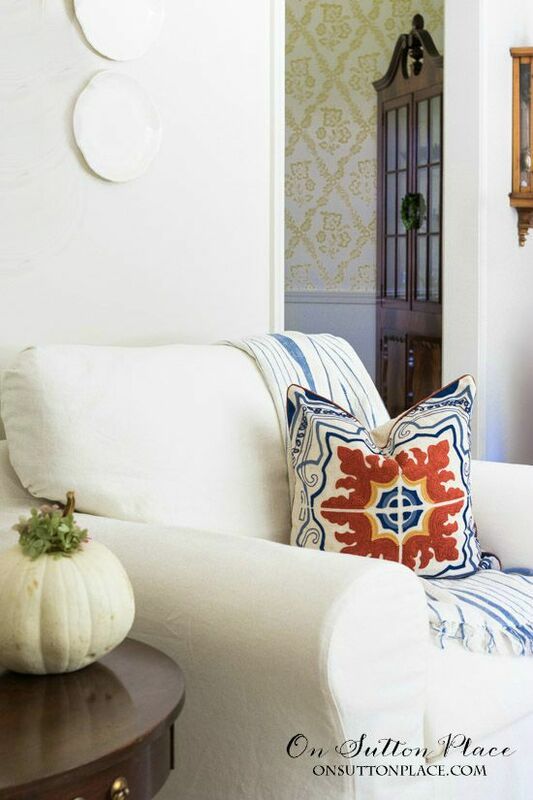 Loving the Pier One blue/copper medallion pillow and, yes, the velvet pumpkins!!???? Also fall is my favorite time of year. Autumn is my favorite season. Your decor is amazing. What a pleasure to look at each photo. Your ideas inspire. Thanks for inspiring me once again. It is looking like Fall here in Atlanta so I need to get busy. ???? You have done it again. 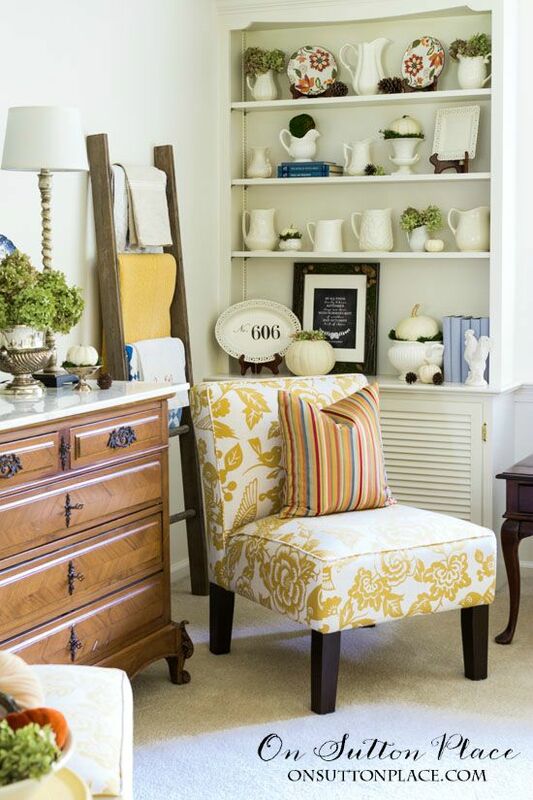 I love every single thing that you decorated with in this post. And so enjoy the beautiful colors. Flowers make me smile too. Enjoyed getting your post on Sunday since it is usually a quiet day for bloggers. Can’t wait to see what you do next!